Do You Need a Rifle Bipod? For a stable shooting platform that offers greater precision and increased support for your AR-15, a rifle bipod is second to none. At long distances, shooting from some positions with accuracy can be next to impossible without some form of stabilization. Marksmen have many variables to account for: environmental factors, the ebb and flow of the body’s natural rhythm, as well as optimizing your position for follow-up shots. But the rifle bipod helps eliminate many of these factors before squeezing the trigger. The term bipod comes from two Greek and Latin terms, “Bi” meaning two and “Pod” meaning foot. So it adds up that a rifle bipod is a two-legged platform that’s mounted at the forend of a weapon. Geometrically speaking, a rifle bipod provides a shooter with stability both horizontally and vertically. 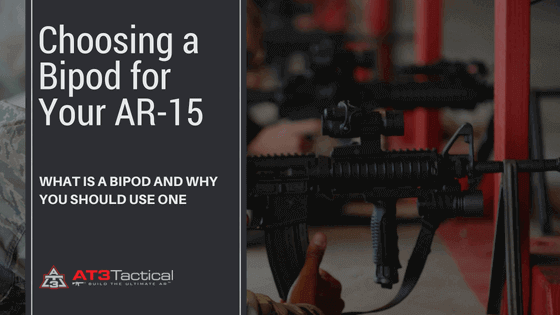 Often marksman find themselves shooting at a target in an uncomfortable position, where stabilizing your AR-15 would be next to impossible without some form of artificial support. Rifle bipods give the shooter the option to rest their weapon, reducing fatigue while increasing their accuracy. Prior to its use for marksmanship, bipods were used by photographers to take high quality, stationary images of an object that would be more difficult without stabilization. However, the first evidence of a weapon mounted bipod goes all the way back to the Second Afghan War in the late 1870’s where Afghan marksman used a primitive form of bipod on the Jezail Rifle. The first mass produced weapon to incorporate a bipod is believed to be the Mondragon M1908 rifle, which certain models featured an integral bipod mounted on the weapon. The advent of the modern sniper (two-man teams shooting from positions of concealment) wasn’t implemented until after WWI, prior to and during WWII. A wide variety of marksman then utilized a rifle bipod for long range-precision shooting. A traditional bipod is a simple two-legged stand that holds the weapon upright, generally they utilize both swivel studs or picatinny rail attachments. The legs can be folded up for easy transportation and locked into place, and many models of bipods offer adjustable legs that allow more shooting positions. Rubberized feet provide greater friction and grip, and the supporting legs adjust to varying heights to accommodate different shooting positions. Grip pods are bipods that are deployed from a foregrip mounted at the fore end of an AR-15. Grip pods are standard issue for military personnel, such as infantryman or heavy machine gunners who need to rapidly transition between standing and prone shooting positions. Affixing a Grip pod is as simple as attaching a conventional foregrip to a weapon depending on the rail system or handguard your AR-15 has. Monopods are a lot like a conventional shooting stick. If you’re unsure of what a shooting stick is, it’s basically a single-legged shooting platform. AR-15 specific monopods mount straight to rail system and can be folded up while they’re not in use. While deployed, monopods can be adjusted to accommodate lengths up to around 4.5-5.5 inches. One issue with monopod is they can’t be attached to swivel mounts, so you must reset your position to engage a new target. A preferred method, for convenience and durability, these bipod mounts affix directly to a quad rail or a picatinny rail segment of a handguard. Picatinny rails allow for accessories to be attached to the weapon without any gunsmithing and often offer quick detachment capability, usually in the form of a retention pin should the need arise to attach or remove the bipod in a hurry without sacrificing stability. Stud bipod mounts affix to the fore end of the AR-15 by removing the handguard off the weapon and screwing the bipod stud directly into the back plate. Stud mounts have a flange for attaching a bipod that swivel and pivot regardless of the style of bipod you use. Keymod rail systems are designed for attaching keymod compatible accessories to an AR-15. Installing a bipod mount is simple, select the keyholes you want to mount the bipod mount to, slide it to the forward position and tighten the retention screw. The M-Lok system is essentially Magpul’s take on the Keymod system. The M-Lok system uses narrow slats and T shape mounting lugs in place of keyholes. M-Lok bipod mounts can be affixed at the front or rear of the slot, so you have greater customization in terms of bipod placement.